While our understanding continues to develop on coal tar sealants, polycyclic aromatic hydrocarbons (PAHs) and human health, occasionally it is good to pull all of what we know together into a succinct summary. That is my hope here. These references serve to inform us of the reasonableness of actions to curtail the use and exposure to coal tar pavement sealers. My contention is that when the facts are laid before us, it presents a compelling reason to stop the use of this product especially in areas where children will be exposed. Much of the information presented below is from a recent summary of research compiled by the USGS as the Edwards Aquifer Authority (Texas) considers a ban of coal tar sealers. All editorial comments are mine. Williams, E. S.; Mahler, B. J.; Van Metre, P. C. Coal-tar pavement sealants might substantially increase children’s PAH exposures. Environ. Pollut. 2012. This “New Initiatives” article in Environmental Pollution estimates that, although dietary ingestion has long been thought to be the primary route of human exposure to polycyclic aromatic hydrocarbons (PAHs), for children 3-5 years of age living in residences adjacent to parking lots with coal-tar-based sealcoat, non-dietary ingestion of PAHs (i.e., ingestion of house dust) is about 2.5 times that of dietary ingestion. Williams, E. S.; Polycyclic Aromatic Hydrocarbons and Human Health. University of Connecticut PAH Seminar, November 2011. This is a video summary of Dr. Williams’ findings. 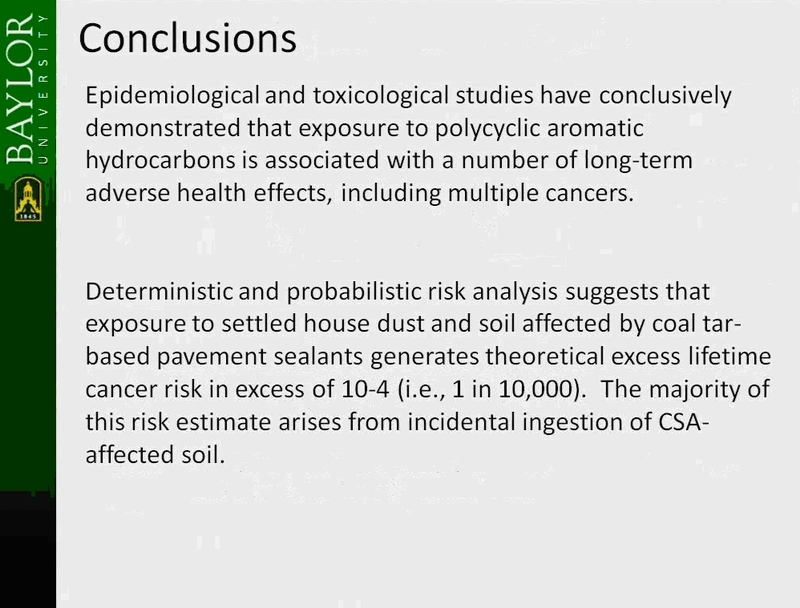 For the first time, a toxicologist publicly presented the probable risks to children exposed to dust tracked into homes from coal tar pavement sealants. An excess risk of 1 in 10,000 was estimated. Federal law deems this risk “unacceptable” and is “sufficient basis” for action.1 The professor from Baylor University, Dr. Spencer Williams, stated additional studies are warranted. from Site Remediation Planning and Management by J. Andy Soesilo, Stephanie R. Wilson, p,2431. 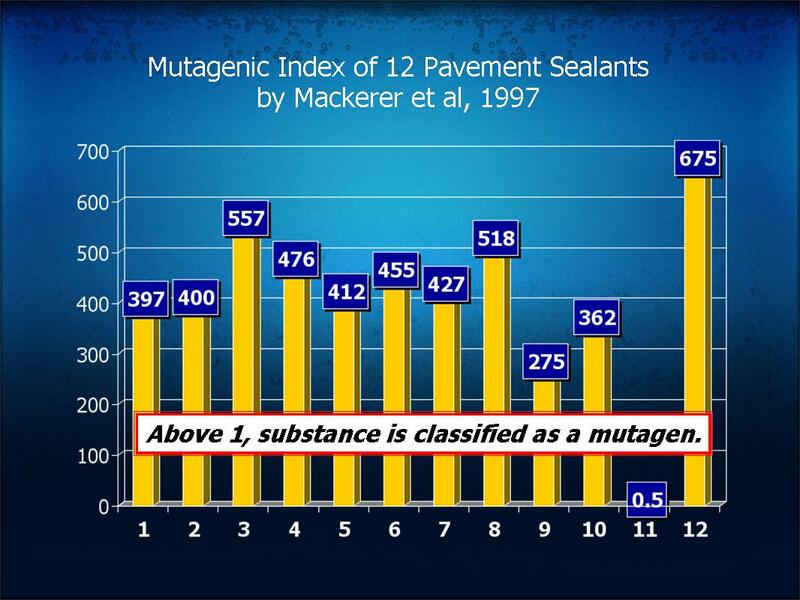 Mackerer, C. R. et al; Mutagenicity and PAC Content of Seal Coatings for Asphalt Pavement. 16th International Conference on Polycyclic Aromatic Compounds, November 1997. We continue to hear some say that coal tar sealants have the toxic ingredients refined out (generally polycyclic aromatic hydrocarbons, PAH). This in spite of the laboratory levels of showing extremely high concentrations. A few years ago, I came across this research that got little attention when presented back in 1997. It pre-dates any of the current understanding of the problem of coal tar sealants. The lead author is the retired head of the Mobil Corporation’s research laboratory. He developed an index to rate the mutagenicity of chemical solutions called the Ames Index. It has been used on other coal or petroleum products as well. Dr. Mackerer decided to do this study after seeing some college students sealing his neighborhood’s driveways. He wondered just how toxic the sealants are. So he went to a hardware store and bought 12 separate products. As the above graph shows, anything above 1.0 is considered a mutagen. The coal tar sealants are an average of about 450! Dr. Mackerer said that while the absolute number can go higher, after a few hundred the real mutagenicity is maxed out . The only problem with this is that it has never been published, but is only a collection of slides summarizing the team’s work. Mahler, B.J. ; Van Metre, P.C. ; Crane, J.L. ; Watts, A.W. ; Scoggins, M.; Williams, E.S., Coal-tar-based Pavement Sealcoat and PAHs: Implications for the Environment, Human Health, and Stormwater Management. Environ. Sci. Technol., 2012. This paper compiles the state of our knowledge about the environmental and human health effects of coal tar sealant as well as the status of legislative action has just been published. In addition to the USGS, contributors included the State of Minnesota Pollution Control Agency, the University of New Hampshire, Baylor University and the City of Austin. The intent of the report is to present much of what has already been published in one document with new information on human health effects and the volatilization of curing sealant. U.S. DEPARTMENT OF HEALTH AND HUMAN SERVICES, Public Health Service Agency for Toxic Substances and Disease Registry, Division of Health Assessment and Consultation: Health Consultation for Leander Independent School District, Proposed Elementary School #19, (Grandview Hills Elementary), Austin, Travis County, Texas, EPA FACILITY ID: TXN000606777, February 13, 2008. For years it was hoped that the federal government toxicologists would just look at the safety of children exposed to coal tar sealants. A few years ago it was discovered that they already had, but it was coincidental. A school district outside of Austin, Texas (Leander) was looking to build a new elementary school. They purchased a property that met their needs except that it had been a chemical research facility. When parents found out, many were very upset. So upset that they got the attention of their elected officials, who in turn brought in the feds (more specifically the Agency for Toxic Substances and Disease Registry ATSDR, who routinely does this kind of work). Keifer, K; Summary of Preliminary Evaluation of Potential Risks from Existing Coal Tar Sealants, Environmental Resources Management, Inc. April 2010. In 2009 the Austin Independent School District (AISD) began to look into this issue at their schools. Below is a link to an interview that was made just as the study was getting started. Since then their toxicologist consultant found that there exist 5 complete CTS exposure pathways from paved surface to child or adult at the school! AISD has since begun a program to prioritize and remove all coal tar sealant remnants from their facilities. They are the first in the nation to do so. The route a substance takes from its source (where it began) to its end point (where it ends), and how people can come into contact with (or get exposed to) it. 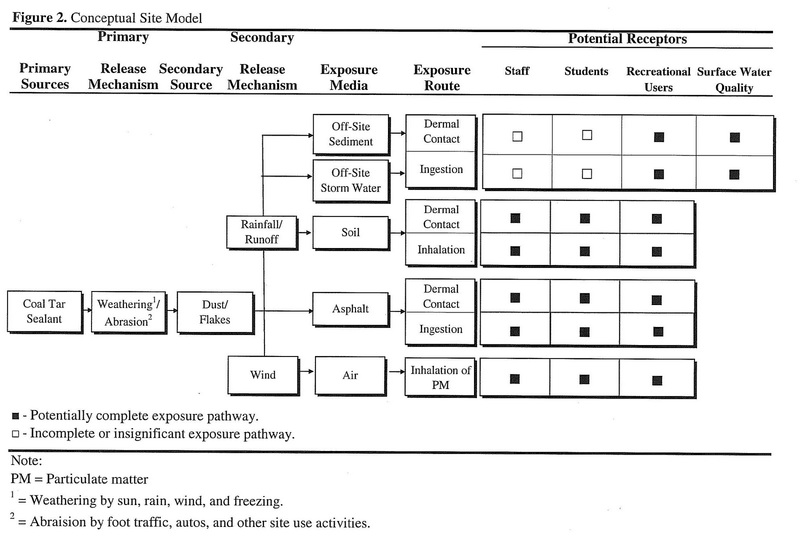 An exposure pathway has five parts: a source of contamination (such as an abandoned business); an environmental media and transport mechanism (such as movement through groundwater); apoint of exposure (such as a private well); a route of exposure (eating, drinking, breathing, or touching), and a receptor population (people potentially or actually exposed). When all five parts are present, the exposure pathway is termed a completed exposure pathway. Coal-tar-based parking lot sealcoat: An unrecognized source of PAH to settled house dust. Mahler, B. J.; Van Metre, P. C.; Wilson, J. T.; Musgrove, M.; Burbank, T. L.; Ennis, T.; Bashara, T. J., Environ. Sci. Technol. 2010, 44, 894-900. This scientific journal article reports that concentrations of PAHs in house dust in residences adjacent to parking lots with coal-tar-sealcoated pavement were 25 times higher than those in house dust in residences adjacent to parking lots with unsealed pavement or pavement with asphalt-based sealcoat. Coal-tars and Derived products. 1985 International Agency for Research on Cancer (IARC) vol 35, 83 p.
This landmark document describes the carcinogenic properties of coal tars and coal-tar pitches, and finds that there is sufficient evidence that coal-tar pitches are carcinogenic in humans. Association of childhood obesity with maternal exposure to ambient air polycyclic aromatic hydrocarbons during pregnancy. Rundle A, Hoepner L, Hassoun A, Oberfield S, Freyer G, Holmes D, Reyes M, Quinn J, Camann D, Perera F, Whyatt R; Am J Epidemiol. 2012 Jun 1;175(11):1163-72. Epub 2012 Apr 13. The data indicate that prenatal exposure to PAHs is associated with obesity in childhood. Prenatal Airborne Polycyclic Aromatic Hydrocarbon Exposure and Child IQ at Age 5, Pediatrics, Jul 20, 2009. Researchers at the Center for Children’s Environmental Health (CCCEH) at the Mailman School of Public Health find that exposure to urban air pollution during pregnancy can result in lower IQ in children. Air pollutants known as PAH’s (polycyclic aromatic hydrocarbons) mostly come from traffic sources, including burning diesel fuel. Burning tobacco also releases PAHs. The result of burning fossil fuels is now linked to lower IQ, and the effects occur before birth. Effect of Prenatal Exposure to Airborne Polycyclic Aromatic Hydrocarbons on Neurodevelopment in the First 3 Years of Life among Inner-City Children, Environ Health Perspect. 2006 August. Residential Proximity to Freeways and Autism in the CHARGE Study, Environ Health Perspect. 2011 June. Living near a freeway was associated with autism. Examination of associations with measured air pollutants is needed. The effects of coal tar based pavement sealer on amphibian development and metamorphosis. 2006. Bryer, P.J., Elliott, J.N., and Willingham, E.J. , Ecotoxicology, vol. 15(3), 241-247. This scientific journal article reports that exposure to sediment contaminated with coal-tar-based pavement sealer resulted in stunted growth and slower development of the frog Xenopus laevis. Coal-tar based pavement sealant toxicity to freshwater macroinvertebrates. Bryer, P.J., Scoggins, M., and McClintock, N.L., 2009. Environmental Pollution, v. 158, no. 5, p. 1932-1937. This scientific journal article reports that exposure to sediment contaminated with coal-tar-based sealcoat resulted in decreased abundance and richness of freshwater macroinvertebrates, an important element in the aquatic food chain. Occurrence of polycyclic aromatic hydrocarbons below coal-tar-sealed parking lots and effects on stream benthic macroinvertebrate communities. Scoggins, M., McClintock, N., Gosselink, L., and Bryer, P., 2007. Journal of the North American Benthological Society, v. 26, no. 4, p. 694-707. This scientific journal article reports a significant decrease in the health of the ecological community downstream from points of discharge of runoff from coal-tar-sealcoated parking lots relative to ecological communities upstream. Toxicity of coal—tar and asphalt sealants to eastern newts, Notophthalmus viridescens. 2010. Bommarito, T., Spading, D.W., and Halbrook, R.S. This scientific journal article reports that exposure of eastern newts to sediment contaminated with coal-tar­based sealcoat resulted in deleterious effects, including difficulty right themselves, impaired ability to swim, and diminished liver enzyme activities. Toxicity of coal-tar pavement sealants and ultraviolet radiation to Ambystoma Maculatwn. 2010. Bommarito, T., Sparling, D.W., and Halbrook, R.W. This scientific journal articles reports that spotted salamanders exposed to sediment contaminated with coal-tar-based sealcoat in sediment had slower rates of growth and diminished ability to swim. Subsequent exposure to ultra-violet radiation resulted in genetic damage. This USGS fact sheet provides an overview of the ways in which coal-tar-based sealcoat contaminates pavement dust, lake sediment, and house dust. Coal-tar-based pavement sealcoat and PAHs: Implications for the environment, human health, and stormwater management. Mahler, B.J. ; Van Metre, P.C. ; Crane, J.L. ; Watts, A.W. ; Scoggins, M.; Williams, E.S., Environ. Sci. Technol., 2012. This Feature article in Environmental Science and Technology summarizes the ways in which coal-tar­based sealcoat contaminates stormwater runoff, lake sediment, soil, house dust, and air, and implications for human and biological health and stormwater management. Parking lot sealcoat: An unrecognized source of urban PAHs. Mahler, B. J.; Van Metre, P. C.; Bashara, T. J.; Wilson, J. T.; Johns, D. A., Environ. Sci. Technol. 2005, 39, (15), 5560-5566. This article was the first to report the potential for coal-tar-based pavement sealcoat to be an important source of PAH contamination. The study of runoff from 13 parking lots found that concentrations of PAHs in particles in runoff from pavement with coal-tar-based sealcoat was, on average, 65 times higher than concentrations in particles in runoff from unsealed asphalt parking lots. Contamination of Stormwater Pond Sediments by Polycyclic Aromatic Hydrocarbons (PAHs) in Minnesota: The Role of Coal Tar-based Sealcoat Products as a Source of PAHs. Crane, J.L., Grosenheider, K., and Wilson, C.B., 2010, Minnesota Pollution Control Agency, 64 p.
This white paper by the Minnesota Pollution Control Agency describes the filling of stormwater ponds with PAH-contaminated sediments, the expense of deposing of the sediments, and the likelihood that coal-tar­based pavement sealants are a substantial contributor to the problem. This report was subject to an “Information Quality Act” challenge from the sealcoat industry, to which the USGS responded. A press release summarized the USGS response. http://www.usgs.gov/newsroom/article.asp?ID=1642&from=rss#.UI3JisXR7tA. This USGS report provides the data used in Mahler et al., 2005. Trends in Hydrophobic Organic Contaminants in Lake Sediments Across the United States, 1970-2001. Van Metre, P.C. and Mahler, BJ., 2005. Environ. Sci. Technol., v. 39, no. 15, p. 5567-5574. This scientific journal article documents upwards trends in PAH contamination in sediment in urban lakes across the United States. PAHs underfoot: Contaminated dust from coal-tar sealcoated pavement is widespread in the United States. Van Metre, P. C.; Mahler, B. J.; Wilson, J. Environ. Sci. Technol. 2009, 43, (1), 20-25. Environ. Sci. Technol. 2009, 43, (1), 20-25. This scientific journal article reports that concentrations of PAHs in dust swept from parking lots across the central, southern, and eastern U.S.—where coal-tar-based sealcoat use is most common—are in the 1000s of mg/kg, concentrations similar to those in contaminated soils of USEPA Superfund Sites. Polycyclic aromatic hydrocarbons in stormwater runoff from sealcoated pavements. Watts, A.W., Ballestero, T.P., Roseen, R.M., and House, J.P., Environ. Sci. Technol. 2010, v. 44(23), 8849-8854. This scientific journal article reports that even partial coverage of a drainage area by coal-tar-based sealant resulted in increased PAH concentrations in sediment. A stormwater swale receiving runoff from both sealed and unsealed lots had PAH concentrations 25 times higher after sealant was applied than prior to sealant application. Influence of coal-tar sealcoat and other carbonaceous materials on polycyclic aromatic hydrocarbon loading in an urban watershed. Yang, Y., Van Metre, P.C., Mahler, B.J., Wilson, J.T., Ligouis, B., Razzaque, M.M., Schaeffer, D.J., and Werth, CJ., 2010,: Environ. Sci. Technol., v. 44, p. 1217-1223. This scientific journal article reports research using organic petrography to quantitatively determine the proportion of PAHs in dust and soil samples originating as coal-tar pitch. The study found that coal-tar pitch, used in coal-tar-based sealcoat, was a dominant source of PAHs in the watershed, contributing as much as 99% of the PAHs in sealed parking lot dust, 92% in unsealed parking lot dust, 88% in commercial area soil, 71% in streambed sediment, and 84% in surficial lake sediment. Contribution of PAHs from Coal-Tar Pavement Sealcoat and Other Sources to 40 U.S. Lakes. Van Metre, P. C.; Mahler, B. J. Sci. of the Total Environ., 2010, v.409, 334-344. This scientific journal article reports that coal-tar-based sealcoat was, on average, the largest source of PAHs to sediment in 40 U.S. lakes, on the basis of a statistical source-apportionment approach. The article also reported that coal-tar-based sealcoat was the source of upward trends in PAH concentrations in seven of eight urban lakes investigated. Volatilization of polycyclic aromatic hydrocarbons from coal-tar-sealed pavement. Van Metre, P. C.; Majewski, M. S.; Mahler, B. J.; Foreman, W. T.; Braun, C. L.; Wilson, J. T.; Burbank, T. Chemosphere, 2012. This scientific journal article reports PAH releases to air from in-use parking lots with and without coal-tar­based sealcoat. The mass of PAHs released to air per unit area of coal-tar-sealed pavement was 60 times greater than that released from unsealed asphalt pavement, even though in all but one case the sealant had been applied from 3 to 8 years prior to sampling. PAH volatilization following application of coal-tar-based pavement sealant. Van Metre, P. C.; Majewski, M. S.; Mahler, B. J.; Foreman, W. T.; Braun, C. L.; Wilson, J. T.; Burbank, T. Atmos. Environ. 2012. This scientific journal article reports enormous releases of PAHs to the atmosphere (one-quarter to one-half of the PAHs contained in the product) during the 15 days following application of coal-tar-based sealant. The authors estimate that PAH emissions from new coal-tar-based sealcoat applications each year (-1000 Mg) are larger than annual vehicle emissions of PAHs for the United States.